What is the SwissDecTX transmitter? The SwissDecTX transmitter is a ready-to-use component performing the salary data transmissions required by the SwissDec v4 directives, for a fraction of the cost it takes to develop, test and validate your own solution. No need to learn and master complex new technologies. No frustrations and no guessing: it just works! Simple to integrate, deploy, and use. Low cost: flat fee, one-time pricing model (no royalties). No risks: this solution is widely deployed in production already. Full multi-year support and maintenance plan available. There is absolutely no telemetry in the SwissDecTX transmitter, neither in the installer not in any of the transmitter’s components. As much as we’d like to collect anonymous usage data and error information, we feel that the confidential nature of salary and employee data should not be compromised. As such, we deliberately decided not to include any telemetry in this product. You application prepares the salary data to be transmitted to the SwissDec receiver (distributor), then calls into the SwissDecTX transmitter to securely send the data to the SwissDec servers over a standard internet connection. The SwissDecTX transmitter takes care of all the transmission details, including digital signature, encryption, actual data transmission and error handling. The transmitter also maintains a transmission journal archive, the retrieves then decodes the server’s responses for you. Optionally, the transmitter can transform the server replies from XML into ready-to-display HTML. The transformations are customizable. The SwissDecTX transmitter strictly conforms to all SwissDec v4 transmission and inter-operability requirements. We have a proven track record of 100% success rate regarding the certification of our SwissDecTX transmitter with more than fifteen Swiss software development firms already, which collectively send tens of thousands of salary declarations every year using our product. See our customer’s page for a list of our current customers. Yes! The SwissDecTX transmitter is a 100% supported product. We help your development team with every step and every aspect of the integration of our transmitter into your application and provide full professional technical support and advice as required. Whatever are your development environment and tools, or programming languages, be assured that the SwissDecTX transmitter is a perfect fit: we will help you make the most of the transmitter in virtually no time at all: most of our customers were able to perform actual transmission tests, from their application, on the first day after adopting our solution ! How does it work in more details? The SwissDecTX transmitter first performs a full local validation of the XML declarations created by your application, to catch any XML syntax problems and/or obvious errors or omissions, using the official SwissDec XSD validation schemas. The data is then transmitted securely, fully signed and encrypted using the SwissDec certificates, to the SwissDec web service (“distributor”) over the internet using TLS/SSL on HTTPS. The transmitter has provisions for HTTP proxy and proxy authentication so it can be used in corporate networks and behind firewalls/proxies. The server’s replies are then decrypted by the transmitter and presented to your application as ready-to-use XML. The transmitter also includes a data transformation engine that formats complex XML replies into ready-to-display HTML, using customizable XSLT style sheets. The resulting HTML can be presented directly to the end-user and conforms to all SwissDec strict requirements regarding the presentation of status, warning and error messages. The HTML output can easily be displayed in a “browser control”, available in all programming environments nowadays, in just a few lines of code. Additionally, the SwissDecTX transmitter includes a conformant transmission journal archive facility, recording all messages sent and received as well as the originally transmitted declaration in unencrypted form, as per SwissDec requirements. The transmissions are packaged together – data, signed low-level messages, and decrypted replies – and archived as standard Zip files in a folder that you designate. You can use file system encryption (EFS or BitLocker) and file system-level access control (ACLs) to secure and lock-down the transmission journal folder if desired. The built-in transmission journal satisfies all SwissDec requirements, so your application does not need to implement its own transmission journal facility: this task is handled entirely by the SwissDecTX transmitter. The SwissDecTX transmitter fully supports all SwissDec workflows, “PIV” and “EIV” as well as interoperability and connectivity test use cases, and covers 100% of the SwissDec transmitter requirements for digital signature, encryption, transmission, logging, error handling and presentation of results. As such, it is fully certifiable as the transmission part of your application, we guarantee it! The SwissDecTX transmitter comes with full professional documentation, in the form of a browsable programmer’s help file in English (CHM format), which describes all technical aspects of the transmitter’s interfaces, every method, every parameter, and every option. Short code snippets included in the help file, written C#, Visual Basic, and C++, demonstrates the use of each feature of the transmitter and can be easily transcripted to any programming languages. An integration guide is also supplied (currently in French, available as part of the SwissDecTX 3.x package), outlining the integration process and use of the transmitter. Furthermore, help is only an email away as we stand behind our product and back it with full technical support. Is it a tested, reliable product? Yes, and we can say so with full confidence. We use the latest in software engineering practices including automatic code reviews through static code analysis that reveals potential flaws in areas such as security and reliability, robustness and performance, as well as automated unit-testing to improve the code quality and prove that the product works as intended and meets all its requirements. The transmitter core has been developed in 2009 and has been thoroughly tested since then, as part of our own internal testing, and by our 15+ customers which collectively deployed it to hundreds of their customer’s sites, in a wide variety of real-life environments. All reported issues have been fixed and there are no known bugs in the production version. Collectively, the production versions of the SwissDecTX transmitter deployed in the field have successfully submitted tens of thousands of employee’s salary declarations, making it the 6th largest SwissDec transmitter in existence, by transmitted volume. 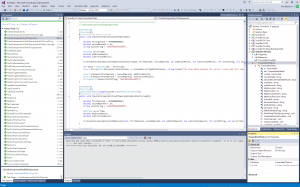 Automated 100% coverage testing of the SwissDecTX 4.00 transmitter in Microsoft Visual Studio 2013. December 2008 – SwissDecTX 1.0 Project kick off. October 2009 – Our first certified SwissDec 2.2 customer enters production. ‎July ‎‎2010 – SwissDecTX 3.0 project kick off. ‎June ‎2013 – SwissDec TX 4.0 project kick off. Today (August 2015): 25 licensed customers in production! Is it compatible with your developement environment? What are the strongest points in favor of SwissDecTX? Above all considerations, the SwissDecTX transmitter is a robust, dependable and small component you can rely upon. Deploy the SwissDecTX transmitter at your customer’s site with confidence, as an integral part of your application. The SwissDecTX transmitter becomes a key asset of your application, it helps your application appear even stronger by providing robust SwissDec transmission services under-the-hood. If you ever attempted to develop your own SwissDec ELM transmitter in the past, you know how difficult, time-consuming and costly it was! Don’t make the same heavy investment again for each new SwissDec standard evolutions: opt for a ready-made, well-tested, well-maintained, ready-to-use and field-proven solution! If you licensed a third-party ELM transmitter in the past, forget about deployment royalties, forget about heavy dependencies on humongous frameworks like Java™, prone to security flaws and requiring their own servicing, introducing breaking changes and compatibility issues. Forget about bugs and instabilities or user-interfaces making your application look bad, and forget about any lack of documentation and support! The SwissDecTX transmitter is stable, lightweight (1.5MB), documented and fully supported! Last but not least, we are 100% neutral in your market segment: we don’t produce, sell or intend to sell any salary applications or accounting packages: you are not buying a SwissDec transmitter from one of your direct competitors, we will never have any conflict of interest with your company or product! Our transmitter is exactly identical for all customers: there is only one binary package available to all, and all updates, enhancement, and fixes are available to all customers at the same instant through this web site. Choose SwissDecTX and forget about the “transmitter problem”. Move-on to more important things, like providing more features and direct value to your customers, instead of spending large amounts of time and money developing (or fighting against) an undocumented low-level technical component or a bulky separate application with heavy dependencies. You also stay in full control of your user interface, as all user interactions are made directly from your application. All formatted HTML outputs of the SwissDecTX transmitter are customizable so you can change the text prompts, fonts, colors, and styles to match any particular look, or use the raw XML replies and extract/format the data yourself if you want, the transmitter can be 100% invisible to the end-user. The license includes one year of full professional support, comprising all software updates and fixes and all necessary technical support for integrating the transmitter in your product. Beyond the first year, a support and maintenance plan is available, as an option, for a small yearly fee. The maintenance plan gives you free access to all updates and evolutions, minor and major, and continued technical support. Ask your regional SUVA expert about the SwissDecTX transmitter: they know about it as our customers have already obtained the SwissDec certification with it in all regions of Switzerland. Your risk is reduced to the minimum with the SwissDecTX transmitter: once you have obtained the green light from your regional SUVA expert, you can virtually consider the job done with SwissDecTX on your side as there are no unknowns, no delays and no unforeseen issues to consider: the transmitter is there today and just works! Feel free to also ask the SwissDec certification team at itServe, in charge of the technical validation of all candidates to the SwissDec certification: they have hands-on experience with our product as they have already certified many salary applications relying on it for data transmission. They have also seen it in practice, in the field, over the years, as they monitor all transmission activities country-wide. We warmly encourage you to ask everyone about our product, your SUVA expert, the SwissDec team at itServe and our existing customers: we are confident that the answers you will get regarding our product’s suitability, performance and support will be very positive! Just send us an email at info@swissdectx.ch, and we’ll get back to you ASAP.